Time is News and Entertainment based channel of India. Its show the latest news from whole country and special news from Punjab, Haryana, Delhi, Himachal Pradesh, J&K, Rajsthan, Uttar Pardesh, Uttrakhand, Jharkhand, Bihar, Maharashtra and Madhya Pardesh etc. 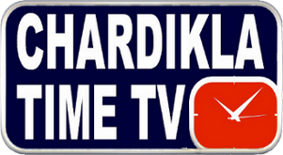 Chardikla Time TV also available on DD Direct Plus and Dish TV platform. TIME TV has made a very strong network of reporters through out India.